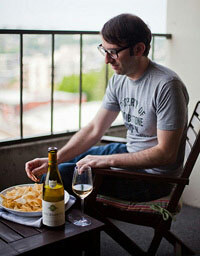 I’ve written quite a bit about wine labels, particularly in a (sporadic) “Label Lust” series. My experience as a retail wine buyer definitely comes into play here. When I looked at wines good enough to buy in bulk for display, not only did the label have to be good, but also THE BOX IT CAME IN. Yes, it had to have an equally pretty cardboard case. I learned this from Whole Foods. Since they don’t allow outside POS (aka branded decorations and other doodads), stores rely on the boxes and labels to serve as visual sizzle. And when you multiply that great duo times 50 cases (or more), it looks very dramatic, especially in a grocery store. One of their selections is an old favorite, the Mulderbosch Cabernet Sauvignon Rosé. Another is a new obsession, the Mille 1000 Pinot Noir Rosé 2016. It has many things I love: it’s a big 1L of wine sealed with a screwcap, costs like 15 bucks, and is extremely easy to drink. Blush and gold with fat lettering on a gold bar? Who wouldn’t love this nicely priced, nicely designed bottle of rosé? We like their bold use of a display font. And they were kind enough to link to my blog post and give me a shout-out. Please read the entire post and let me know what you think of their other choices and the rationale behind them. What are your favorite wine labels? Drop me a link in the comments. 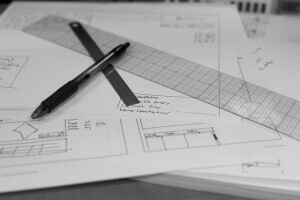 “Design Sketches” photo by Andrew Turner via Flickr. I mean, it has nothing to do with wine label design (OR DOES IT? ), but depicts the raw stages of creativity and has a bunch of cool rulers/tools, etc.